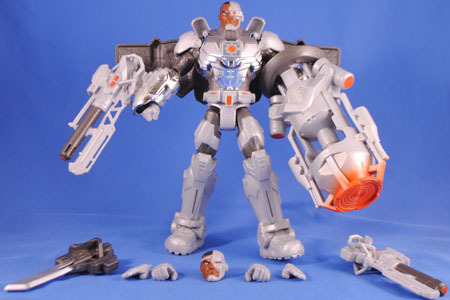 I have never, nor will likely ever, understand the popularity of Cyborg. But, I do love me some Total Heroes, so I couldn't pass this up. Despite my distaste for the character this is the second-best use of the "Ultra" (read: deluxe) format for the line (first being the Green Lantern Corps). Victor Stone was a star athlete in school, but what he really yearned for was his father's approval. Silas Stone was the top scientist at STAR Labs who was too focused on his work to notice his son... until the day Vic was gravely injured in an explosion caused by Darkseid's invasion of Earth. 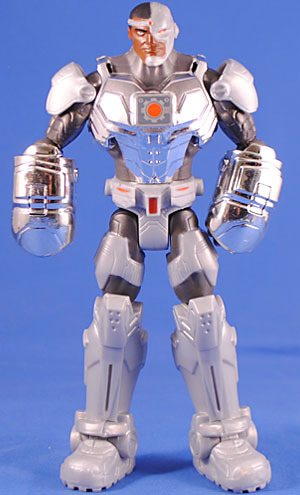 To save his son's life, Silas transformed Vic into the hybrid of man and machine known as Cyborg. A true hero for a modern age, Cyborg is a digital and physical tank capable of interfacing with all forms of technology - no brick wall or network firewall can keep him out! And, while his cybernetic enhancements were crucial in the battle against Darkseid, it was his bravery and resourcefulness that compelled the Justice League to recruit him as their youngest member. 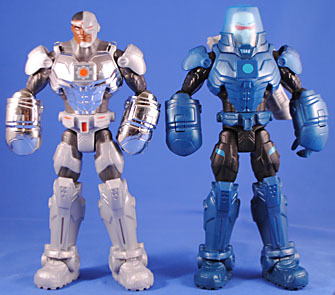 Cyborg uses the same armored body as Mr. Freeze and Lex Luthor, which is a pretty nice sculpt, actually. It gets the same 14 points of articulation as the other figures, though this body has the added touch of hinged shoulder pads that plug into the shoulder pins (or maybe even are the hinge pin for that joint). 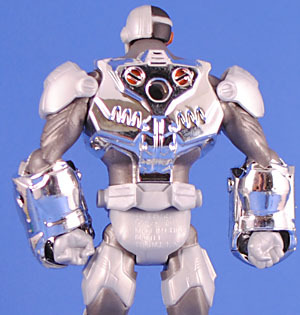 Paint-wise, it's pretty much what you'd expect for Cyborg and Total Heroes, but this guy gets vac-metallized gauntlets and torso because... shiny. Vac-metallizing is also something I'll never really "get," but some folks surely do love it so. They get hyper defensive for something that always looks so bad. Like all of the "Ultra" Total Heroes figures we get a bevy of accessories, which really help make him better than other releases like Black Manta, Batman Beyond and Firestorm, well... certainly Black Manta, at least. 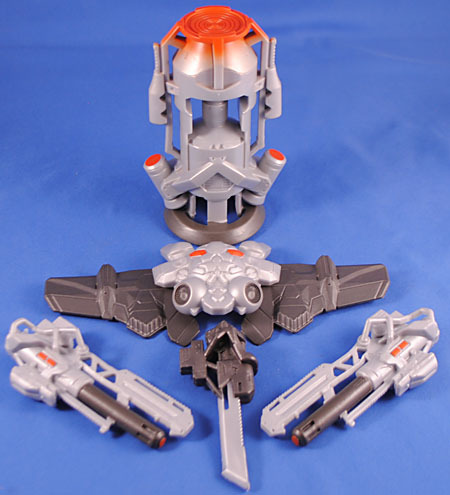 In addition to the figure we get a winged backpack, two plug-in guns, a plug-in blade, a gigantic arm cannon, a pair of flat hands, a pair of holding hands and an alternate head. The normal head is based on his classic, Marv-Wolfman-designed look, with half a robot face and a totally rad tiara headband - hey, he was created in the '80s, what can you do? The other one is more modern, with no jazzercize forehead strap, and a blatantly robotic set of sensors in place of his left eye. 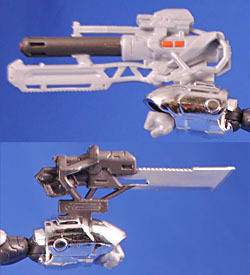 The guns and blade have thick tabs that pop into the spring-loaded rectangles in the gauntlets, finally explaing/confirming their purpose (I'd actually kind of dig it they got the guns out recolored as a freeze ray for Freeze or a kryptonite cannon for Lex). The big giant cannon thing is the neatest accesory in the batch, though, and it fits on his arm over the gauntlet pretty snuggly. However, once again the joints are too weak to keep his arm elevated while wielding it. The red spray on its muzzle, presumably for "engery blast" effect, is pretty hokey though. 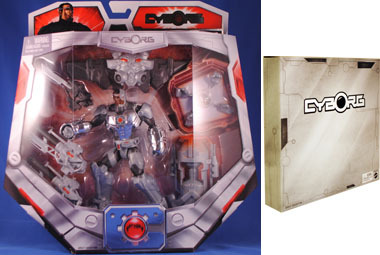 Cyborg came packaged in a nice silver and red window box, which in turn was packed in a printed mailer box, because if there's one thing Mattel loves, it's charging us extra money for more packaging than we really need. The back of the card has the afore-transcribed bio plus some stats and photos of the figure. Overall I'm pleased with the release, though I'm not convinced he was a good choice for the "Ultra" format (despite the obviousness of his inclusion). As mentioned, I really do love the Total Heroes format, but like with all things Mattel, they just never got behind it. Toys Я Us was the only store near me that carried it and they had an absolutely absurd 50-75% mark-up over the SRP making the figures way too expensive. The "Ultra" figures should have been at at-retail deluxe series to help build out the line, so if only Mattel had done that and managed to get these wider distrubtion at the $9.99 MSRP (and actually believed in and hyped the line) it really could have taken off. Oh well. What can you do?